Chuck and Corinne Kanter combined their 30 years of sailing experience, common sense and humor to create their latest book, Cruising is Contagious. The authors of such classics as Cruising, on More Than One Hull, The Galley KISS Cookbook, and The Cruising KISS Cookbook, Chuck and Corinne are no strangers to the written word, as their latest self-published effort clearly demonstrates. Cruising is Contagious is a collection of essays, anecdotes, humorous vignettes and just plain good sailing sense that will inspire all, from the full time live aboard (and those aspiring to be) to the day sailor. The selection varies from straightforward tips on weathering a hurricane, in a first hand narration entitled, "How We Survived Hurricane Erin," to an insightful and informative travelogue on the Kanters' cruise to Cuba. All throughout the book are humorous stories of lessons learned from experiences such as having pets and plants on board, and more sober reflections on safety and prudence while sailing. is available from SailCo Press, P.O. Box 2099, Kay Largo, Fl. 33037. Chuck Kanter is a regular contributor to Multihulls, and Southwinds magazines, and author of Cruising, on More Than One Hull, as well as co-author of The Multihull Cruising Guide. He is an marine surveyor specializing in multihull vessels. 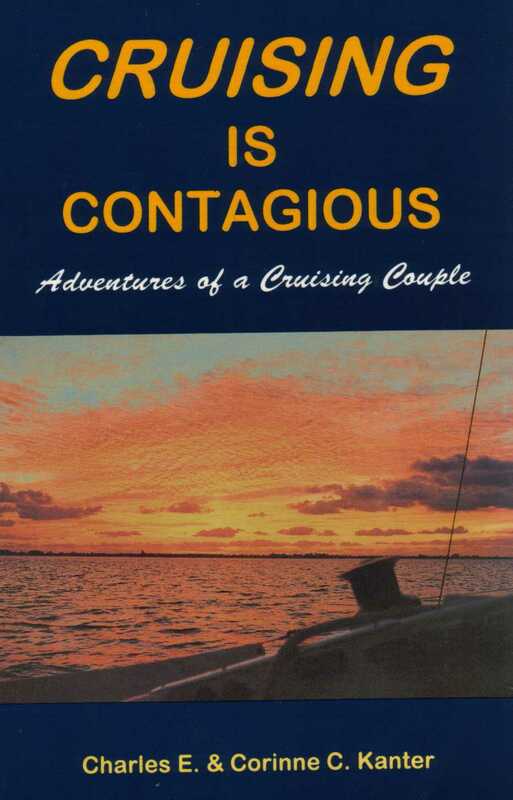 Cruising is Contagious is a great book designed to get you into the spirit of cruising. I enjoyed reading about the cultural differences found in our neighboring Caribbean countries, like Bahamas and Cuba. I also found useful Corinne's writings on the full time live aboard lifestyle, and her ideas on how to finance the cruising life. Even more valuable to me are Chuck and Corinne's common sense approach to sailing and safety, demonstrated in almost every story. Multihull sailors will also find useful Chuck's ideas on catamaran sailing, which includes good ideas on setting anchors. Corinne Kanter is the Julia Child of the boating world (although much nicer, I think) and the author of Corinne's Culinary Corner, a regular feature of Multihulls magazine. She has authored two cookbooks, The Galley KISS Cookbook and The Cruising KISS Cookbook. Chuck and Corinne's chatty conversational writing style further adds to the personality of this book, which reads as if you're just having coffee with them in the cockpit of their catamaran, La Forza. The cruising bug bites hard with this one, and rightfully so. Fourteen years full time aboard La Forza, and thousands of miles under their hulls attest to the simple fact that indeed, cruising IS contagious...beware!